I can't believe it! We made the top 10 list!!! @theycallmedan has offered a 10,000 SP delegation for a YEAR! And SPUNKEE MONKEE made the list! We happen to be at the bottom... hehehe but you can bring us higher??? Pleeeeeeeease :) We need 80 more votes to take first place. It does not cost anything to vote - just log in with your Steem account! Think it's impossible?? come onnnnnn! WE CAN DO IT!!!! WE ARE MONKEES!!!! 10,000 SP would be awesome to upvote the Monkees!!! And then just think! 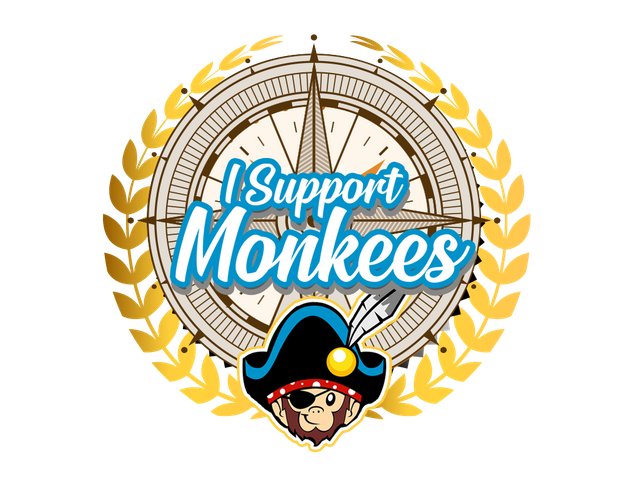 you can be supporting the Monkees through a simple vote and wear this SUPER cool badge!!!! We really believe this project will make an sweet impact on families and our beloved Steem blockchain! Your help makes a BIG difference!!! Before you forget - Give us your support at Fundition or Kickstarter! HAVE YOU MISSED THE FUN? Check out these posts below! My Monkee can have BLING?? YEP! Come see! Shop the Monkee Store? yahoo! Monkee Trading? Let's make a deal! All Spunkee Monkee images have been created for Spunkee Monkee by the amazing @jimramones! Images are not to be used without permission from Spunkee Monkee. Done and done my dear. Also I believe it's 'crowdmind' not 'crownmind'? oh hahahaha did i misspell??? geez.